Although this is not strictly origami, it is made out of origami paper and fits perfectly with our origami models, such as the witch's cat. You will need a glue stick and a pair of scissors. Young children should be supervised or given help with the cutting. 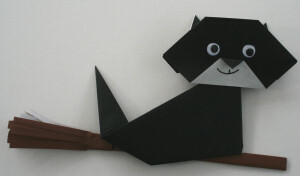 Make this wooden spoon cat puppet as a companion for our wooden spoon witch puppet. Here is a handprint craft with a difference, perfect for kids of all ages to make at Halloween!